Increased toll-like receptors and p53 levels regulate apoptosis and angiogenesis in non-muscle invasive bladder cancer: mechanism of action of P-MAPA biological response modifier. The new modalities for treating patients with non-muscle invasive bladder cancer (NMIBC) for whom BCG (Bacillus Calmette-Guerin) has failed or is contraindicated are recently increasing due to the development of new drugs. Although intravesical agents like mitomycin C and BCG are routinely used, there is a need for more potent and/or less-toxic agents. In this scenario, a new perspective is represented by P-MAPA (Protein Aggregate Magnesium-Ammonium Phospholinoleate-Palmitoleate Anhydride), developed by Farmabrasilis. 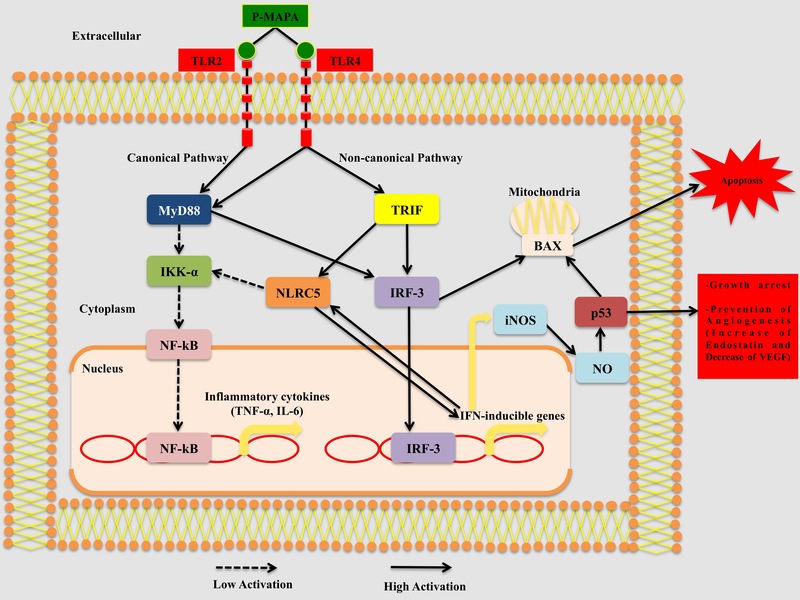 This study detailed and characterized the mechanisms of action of P-MAPA based on activation of mediators of Toll-like Receptors (TLRs) 2 and 4 signaling pathways and p53 in regulating angiogenesis and apoptosis in an animal model of NMIBC, as well as, compared these mechanisms with BCG treatment. However, P-MAPA intravesical immunotherapy led to distinct activation of TLRs 2 and 4-mediated innate immune system, resulting in increased interferons signaling pathway (TRIF-dependent pathway), which was more effective than BCG in the NMIBC treatment. 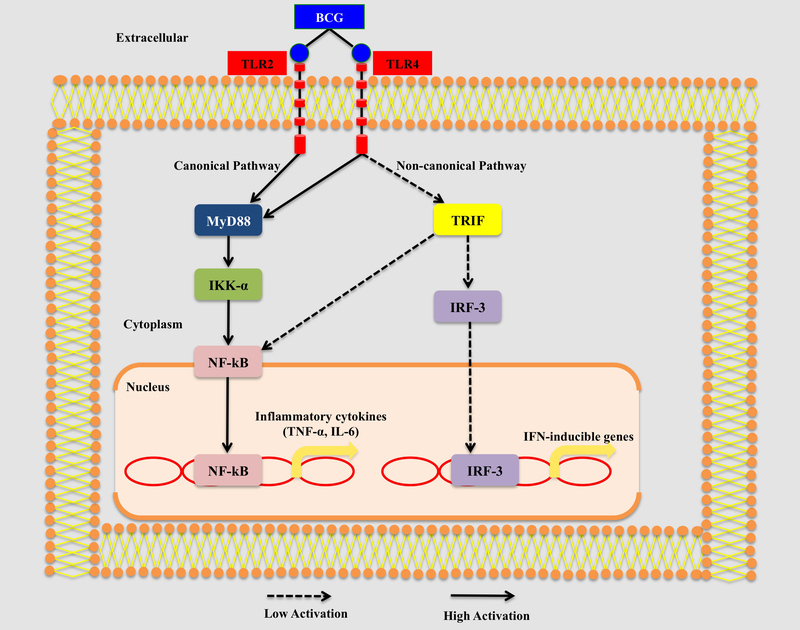 Interferon signaling pathway activation induced by P-MAPA led to increase of iNOS protein levels, resulting in apoptosis and histopathological recovery. Additionally, P-MAPA immunotherapy increased wild-type p53 protein levels. The increased wild-type p53 protein levels were fundamental to NO-induced apoptosis and the up-regulation of BAX. Furthermore, interferon signaling pathway induction and increased p53 protein levels by P-MAPA led to remarkable antitumor effects, not only suppressing abnormal cell proliferation, but also by preventing continuous expansion of tumor mass through suppression of angiogenesis, which was characterized by decreased VEGF and increased endostatin protein levels. Thus, P-MAPA immunotherapy could be considered an important new therapeutic strategy for treatment of bladder cancer as well as, opens a new perspective for treatment for treatment of pacients with bladder cancer that are refractory or resistant to BCG intravesical therapy.